Perfecting the quality was not even the purpose for the breeders of White Label: the weed seeds of the White Haze already had enough power and potency. In that respect, there is nothing more you can teach this award-winner. Perfecting the quality was not even the purpose for the breeders of White Label: the weed seeds of the White Haze already had enough power and potency. In that respect, there is nothing more you can teach this award-winner. 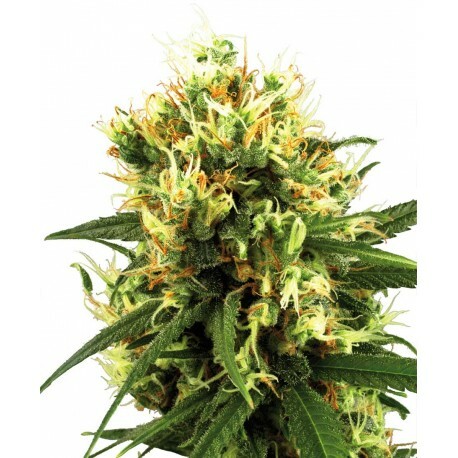 A small issue however had to do with the dependency on the light cycle because an autoflowering variant of the White Haze cannabis seeds did not exist yet. This has now changed: the White Haze Automatic cannabis seeds are a fact! Thanks to the addition of a selected ruderalis the cultivation has become even easier and because the light cycle is no longer an issue it almost goes without saying that multiple harvests per year can be brought in. Outdoors (in a Mediterranean climate) or indoors, these weed seeds just sky-rocket! And we also have to mention that this variety is feminised: this means a 100 percent female harvest! This fifty-fifty combination of sativa and indica ensures both the stoned and the high effect the demanding consumer is looking for. The sweet odour is unmistakeably White Haze and the buds are sticky due to the resin. The plants remain at an acceptable height indoors (approximately 1.5 metres maximum) so you do not have to renovate your ceiling. Convenience and enjoyment: that is the White Haze Automatic! Buy those cannabis seeds!